Has the property market bottomed out? Whisper it, but is it time to suggest that the property market has finally bottomed out? I say, whisper it, because that is what some American commentators are beginning to suggest. And we all know the old truth: if it happens in America, we can pretty well guarantee it happening here in the UK. One guess is that the hardest hit housing markets in the UK could still see some decline, but the bottom is very close elsewhere. It is worth remembering that when prices hit bottom, they tend to bounce back with some energy – rubber ball syndrome! 1 - Take repossessions (by banks and mortgage lenders). In a lot of cases it is now cheaper to buy a repossessed house than it would be to rebuild the original. There is a key principle at work here. A residential property “hits bottom” when the selling price is lower than the cost to build originally. It’s just about the best possible deal you can get – and if it’s a particularly nice home in a good ‘location’, then you could be quids in. As always, demand is the key when it comes to moving housing prices and there are enough green shoots out there to suggest that demand is on the up. 2 - Prices are finally so low that cash flowing for rental is viable again as a property investment and retirement strategy. History tells us that the housing market boom ran prices up so much that landlords found their ownership costs often outstripping their cashflow from rentals. In short, they could not raise their rents high enough to support higher property prices. Today, the low selling prices of properties are easing the worries over cashflow for landlords. The rental property market may not be quite at the “cooking on gas” stage, but a more positive cashflow is starting to cheer the market. 3 – Most encouraging for landlords is the ability to generate equity on day one. When purchase prices are low, there are a variety of benefits to the property owner. Equity is the difference between what you owe on your mortgage, and the total market value of the property. 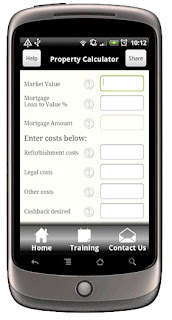 Just taking a repossessed, vacant or very cheap property and putting it back into service will add instant equity. If you can manage repair and maintenance costs, then you should be on a winner. So, as I said at the start, whisper it – but the bottom line for smart home buyers and investors may suggest that this is the housing market we have all been waiting for . . . Enjoying a warm Dublin welcome today. I have a speaking engagement at The Berkeley Hotel in Dublin. Very nice place, very nice people. A 'three country' day today! Busy day today, taking in three 'countries' - England-Wales-England-Ireland. Early start from my London hotel to head to Cardiff for a Welsh Government meeting. Then back to Bristol for a flight to Dublin. It's all very hush-hush - but I am in London today for a full-day's filming for an exciting new TV series. Can't tell you much more as the TV company will be releasing news when they are good and ready. But it's been great fun filming so far and I am looking forward to today's session. Seats are going fast for the two-day 'Wealth Intensive Training' course taking place in London, July 21-22. Don't forget to check out my website. My team members are hard at work updating it this weekend and there'll be some new material on the site next week. Big meeting in London today. The TV company behind a major new series wants a chat. It's all very hush-hush at the moment. Exciting times! 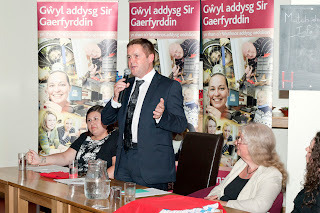 South Wales entrepreneur Kevin Green was the guest speaker at the Carmarthenshire Adult Learning Group’s annual awards ceremony, but he’d be the first to admit that he wasn’t the star attraction. “The true stars of the evening were the adult learners themselves and it was great to see them receiving recognition for all their hard work. “I was something of a ‘late-starter’ in life, so I think many of the adult learners were interested to learn how I’d managed to build my career. “Hopefully, I was able to give them some entertaining and informative messages to help them go on to bigger and better things in life. “Some of the stories the adult learners themselves had to tell were truly inspirational and the experience of attending the awards ceremony was a very humbling one. The other guest speaker during the awards evening was Joanne Yeo, who was recently crowned Volunteer of the Year. Other guests at the ceremony, held at Llanelli’s Parc y Scarlets, included Llanelli AM Keith Davies, Llanelli Town Mayor Councillor Winston Lemon and former Carmarthenshire Council chairman Councillor Tegwen Devichand. South Wales entrepreneur Kevin Green has launched a mobile phone ‘app’ for top wealth tips. 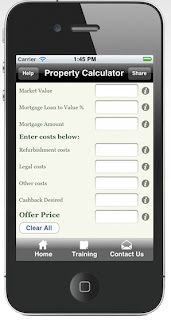 The app has been launched for both iPhone and Android mobile phones – and is free. “It’s no secret that I love modern technology and am a fan of all sorts of gadgets,” said Green. “What fascinates me so much is how we can use and develop technology to help generate opportunities to create wealth. 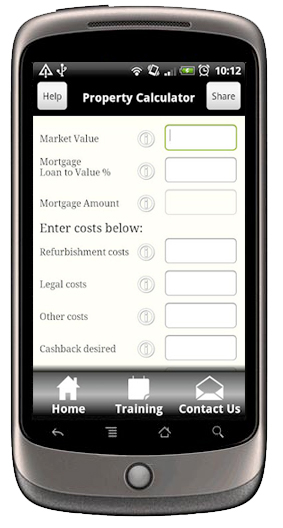 The app features a property offer price calculator designed especially for property investors. “This is something which will be particularly interesting and useful for people interested in following my footsteps in building a property portfolio,” said Green. 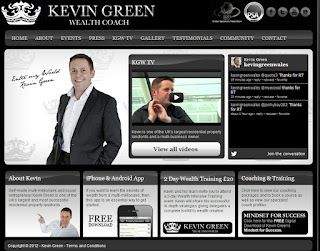 The app also features training videos by Green, who was featured on Channel 4’s Secret Millionaire programme. The app has been developed by The App Geeks. The App Geeks are also developing the app to include additional free updates to include calculating yields, net returns and returns on capital invested. 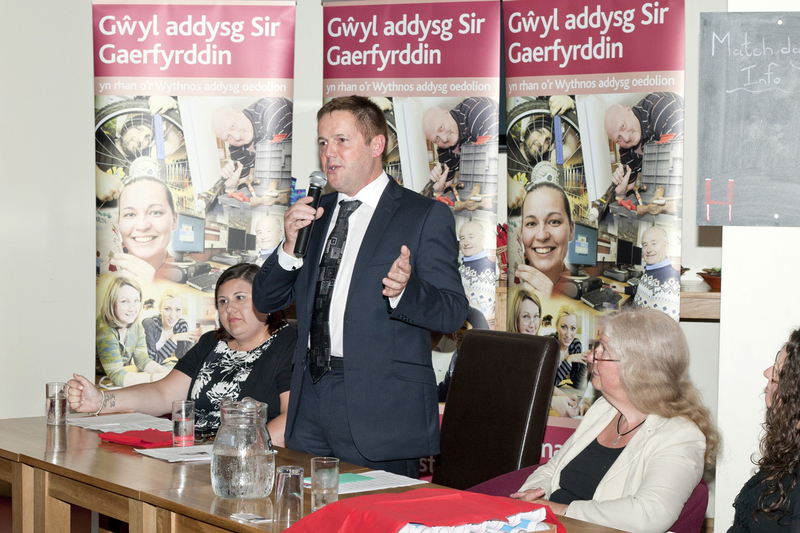 The Dynamo project is part of Big Ideas Wales, the body which promotes projects delivered by the Welsh Government's Youth Entrepreneurship Strategy. The build-up has started to an exciting new Wales-wide project which will be based in Swansea. Had a good meeting this week with team members behind the project, which will be based at the Dylan Thomas Centre building in Swansea. More news about this project to follow soon . . .